The Finnish AMV (Armored Modular Vehicle) has been a highly successful Armoured Fighting Vehicle in terms of the number of countries who operate it, thanks to its constant adaptability to fulfil roles and increasing levels of protection due to its modular construction resulting in a well deserved fearsome reputation on the battlefield. The USMC has operated with a great deal of success a family of over 700 8×8 wheeled LAV-25’s since the 1980’s and is now seeking a replacement through a program called “Marine Personnel Carrier” (MPC). 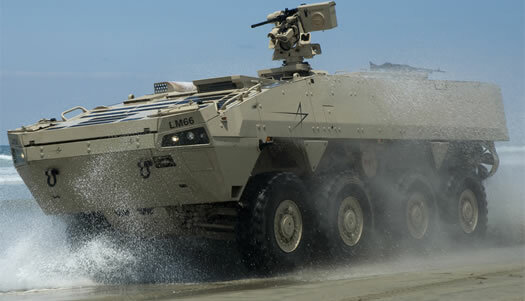 In 2007 Lockheed Martin teamed up with the AMV manufacturer Patria to be a competitor for the program designated Havoc 8×8 Marine Personnel Carrier. The new hybrid vehicle called Havoc, is a Patria 8×8 AMV embedded with Lockheed technology and protection systems. Each company received $3.5 million contracts for a demonstration and study vehicle for water performance evaluation, survivability testing, and an analysis of human factors and stowage capacity starting in fall 2012 lasting 8 months. Evaluations will take place at the Amphibious Vehicle Test Branch aboard Camp Pendleton, California, with further evaluations at the Nevada Automotive Test Center in Carson City. In June 2013 the Marine Corps officially put the MPC program on hold. in February 2014, General Jim Amos decided to postpone development of the Amphibious Combat Vehicle program and return funding to the MPC program, now known as Amphibious Combat Vehicle (ACV) Phase I program. In September 2014 The Havoc successfully completed the Nevada Automotive Test Center’s challenging Butte Mountain Trail course, one of the most severe off-road test tracks in the world.